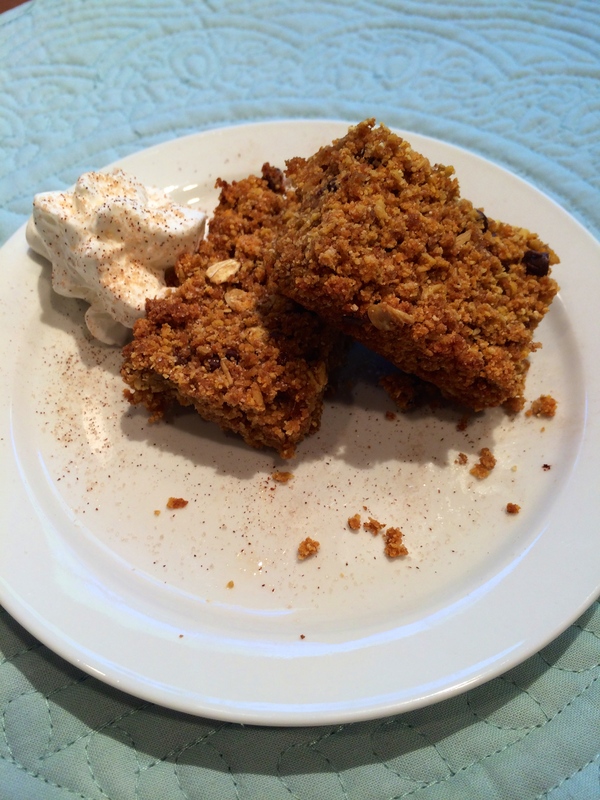 These aren’t your typical Chocolate Chip Pumpkin Squares, but they’re still delicious. I taste-tested these on my dad, the king of desserts. He not only approved, but asked me to bake more, so I’m thinking these must be good. I recently acquired coconut oil, coconut flour and coconut sugar and have been waiting for the right recipe to give these ingredients a try. I made the pumpkin squares two ways: one with coconut flour (for a gluten-free option) and the other one with whole-wheat flour. Based on the flavor and consistency, I enjoyed the ones made with whole-wheat flour more; they were more cake-like and true to the pumpkin spice flavor. Neither has a strong pumpkin flavor, but then again, we associate that “pumpkin flavor” with rich, sweet, decadent pumpkin pie. Either way, these pumpkin squares are a bite-size dessert! Ingredients (makes 16-20 small squares; serving 1-2 squares). * NOTE: for a gluten-free option, use coconut flour. However, this flour gives the squares a “crumble” consistency and adds a more coconut flavor. (After some research, when using coconut flour, you’re supposed to add eggs to “bind” the flour together.) See pictures below for comparison of two types: whole wheat flour versus coconut flour). Preheat the oven to 325° F. Grease an 8×8 baking pan. To make “oat flour,” in a small food processor or small blender, pulverize 1 c oats until powder-like. In a large bowl, combine dry ingredients (flour through brown sugar). Set aside. In a medium bowl, combine melted coconut oil (or vegetable oil), pumpkin puree, vanilla and agave. Mix well. Add to the dry ingredients. Mix with wooden spoon or mixer until a batter-like consistency forms. Pour batter into the greased baking pan. Bake for 20-25 min. or until firm. Allow pumpkin squares to cool. Then cut into 1″ squares. 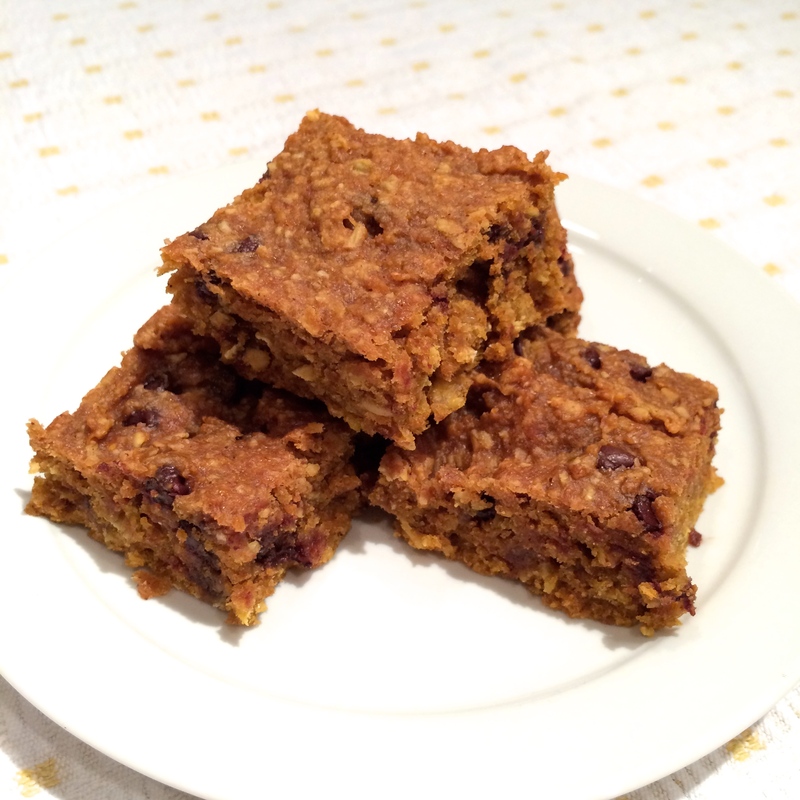 Adapted from Chocolate-Covered Katie‘s Pumpkin Chocolate Chip Cookie Bars. Pumpkin squares made with whole wheat flour — cake-like consistency. Pumpkin squares made with coconut flour — crumble consistency and gluten-free. These look amazing! I love pumpkin anything really. Haha! Annie! 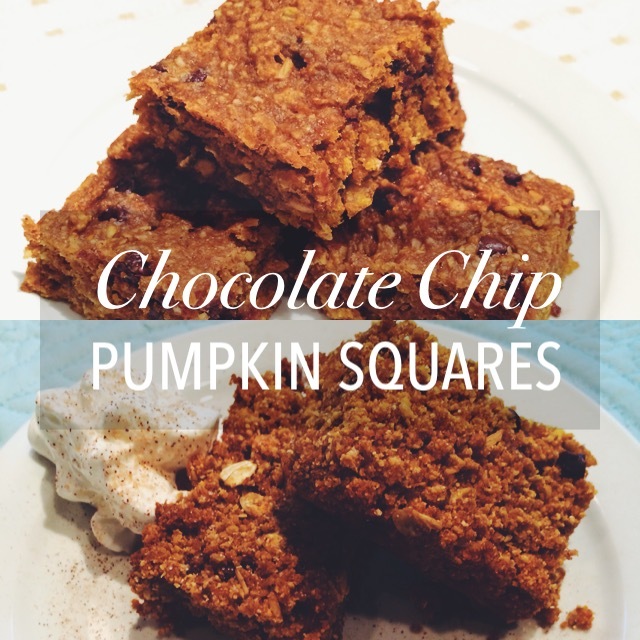 I made these squares last night and they are delish! Instead of coconut flour I used my go-to GF flour (BetterBatter) and doubled the pumpkin, resulting in a very moist GF treat. Will def be making these again soon! Hey Cole! Glad you liked them :) I’ll have to try more pumpkin next time!